Fact: The use of Hawk-Eye imaging technology has been a fantastic development for the sport of tennis. Even if it’s not the most accurate system out there, it’s enabled fans and players to get a second look at a dubious line call by the chair umpire or one of the line judges. Nobody in their right mind would advocate going back in time and ditching this now crucial element of the game. Problem: From the beginning, the onus of challenging a call has been placed on the players themselves. It is they who have to figure out how to manage the finite number of challenges they receive in each set. Thus, reviewing a call has become a sort of mini game-show during a tennis match (“Will X challenge? He/she only has 1 left…was it in? Oh, so close!”) that has all to do with entertainment and little to do with the competition itself (and fairness, really). Key Concept: Providing accurate line calls for professional tennis matches should be the province of the ruling bodies of the sport, not of the players themselves. The goal of the governing bodies in tennis should be to provide the largest percentage of accurate calls, without requiring the players to audit their work. Solution: I’m not here to propose a new technology that would magically call all the lines in real time. That doesn’t exist yet. But I do want to propose a tweak in the current protocol that is used for challenging calls. And the best part is, only a small technological component is required, and it’s something that’s fairly common and readily available around the world. This is all I needed to know in order to propose the new protocol below. – Instead of using a walkie-talkie to communicate with the umpire sitting with the Hawk-Eye people, both of these officials would use small headsets so that they can be in constant communication. If you follow the English Premier League, you would have noticed this system already in place to aid the communication between the referee and his/her assistants. These little headsets are the only additional technological component that is involved in this entire proposal. Naturally, the umpires can keep the walkie-talkies as a backup mode of communication. Notice that I don’t call for ALL shots to be reviewed – Hawk-Eye can’t possibly do that, since it has to re-create a shot in order to figure out if a ball was in or out. However, there is plenty of time between points for the team working the technology to review all point-ending shots (nowadays we’re getting challenges up on a screen in around 10 seconds, and most players seem to take at least 15 seconds between points anyway). However, we don’t need to “see” all of these Hawk-Eye images on the screen: the umpire sitting in the booth with the monitors can simply tell the chair umpire what the outcome of a point was, and he or she can communicate said outcome to the players via the usual hand signals (index finger up for a ball that was out, horizontal hand for a ball that was in). The main point here is that tennis matches would more or less go back to taking place as they did during the pre-Hawk-Eye era. That is, until the booth upstairs lets the chair umpire know between points whether the last ball in the point was out instead of in, or in instead of out (in this last case, prompting the replay of the point, depending on the circumstance). Instant benefit: No more time wasted by players wondering about whether they should challenge a ball or not. No more trips to a line to inspect a ball mark (except on clay, obviously). They can continue to go about their business knowing that the last ball will always be reviewed, no matter what. 2. The last shot in every rally. Now, you’ll say that some players take less than 10 seconds between first and second serves, which would get in the way of the booth upstairs letting the chair umpire know if a first serve was indeed out or not. The easy answer to this is that waiting for the chair umpire to get the call from upstairs is optional: a player can choose to wait a bit (and thus not thwart their own service rhythm) or they can choose to move on and hit a second serve. And we can all agree that most serves are correctly called in or out by the on-court officials – close calls are relatively rare. Regardless, the wait for the Hawk-Eye/chair umpire call would take less time than what we currently have on close serves that get called out: players standing still, looking for a ball mark, and then debating for a few seconds about whether the first serve is worth a challenge or not. Mo Lahyani would absolutely love this, right? Please don’t confuse this with me advocating for players to have infinite challenges. That was used during Davis Cup a few years ago and it was a mess. What I’m advocating is for a player to be able to stop play whenever he/she thinks that a shot that has been called good on their own side of the court by the line judges/chair umpire was actually out. In order to do this, Player X has to do the same thing players do these days: immediately stop play after the controversial shot and signal for the review. Why won’t this generate a rash of challenges (since there is no limit to stopping play)? For a simple reason: if the ball was in, the “challenging” player loses the point. I’m sure the vast majority of players don’t want to lose points for the sake of time-wasting or catching a breath. These special situations can be shown on the screens for people to clap to or groan at. See? I’m not completely against the entertainment value of the challenge system. Instant Benefit 1: There would be no more dicey calls at the end of sets that go unchallenged because a player has run out of opportunities to use Hawk-Eye. More accurate calls will be made without the need of a player auditing line calls on both sides of the court. In the past, I thought that adding the extra umpire for the Hawk-Eye booth would be the death-knell for this proposal. After all, tennis events don’t necessarily like paying for line calling (or Hawk-Eye, really), and this would increase costs by requiring an extra umpire. But when I read James Pham’s piece, I learned that the extra umpire was already there. The only element that was missing was a more efficient communication system between the umpire upstairs and the chair umpire on the court. The headsets that this new protocol would require are not that expensive (considering the budgets of ATP events): a quick Google search – literally done in about 30 seconds – found this alternative, which would amount to $688 in one-time extra costs per court (since the headsets don’t get thrown out after every event). Given that Hawk-Eye already costs between $20,000 and $25,000 set up per court, this is hardly a game-changing investment. Plus, since the ATP/WTA/ITF would be the ones paying for it (given that it would be equipment required for umpires), I’m sure they can get a bulk discount somewhere. One last word about Hawk-Eye in general: it is blatantly unfair that only some courts have the system in place. Having the challenge system is an advantage that all players should enjoy (since it improves the quality of the line calling). The issue here is money, but I do hope that more events follow the lead of Indian Wells and do what is right: have Hawk-Eye on every single court. Good suggestions. I’d add one more: Whenever the the chair ump overrules a line judge, the shot is automatically be reviewed by Hawkeye. We approach a time when the question will be why there are linesjudges. Obviously we’re not there yet, but the question is on the horizon. Besides the unfair nature of having Hawkeye on some courts and not all, there is the issue of players’ familiarity with the system. Learning how to manage challenges is clearly a skill that requires practice; isn’t a lower ranked player already entering a show court at a disadvantage against a top tier opponent? They’re less accustomed to bigger courts, and bigger crowds. I’m not saying that’s unfair, it’s part of the challenge in moving up to the bigs. But we shouldn’t really accept an institutionalized disadvantage like the one they have because they’re unused to Hawkeye. Resolving that disparity should be a goal, too. Goes without saying, I agree completely with your point. In spite of some poor pronoun/antecedent structure in my comment (proofread? we don’t need no stinkin’ proofread), I do think this aspect of the Hawkeye situation is pretty unbalanced. On the other hand it’s not as if I can see a solution in the near future (cost, staff power on the monitoring side, etc), but it *is* an additional and rather unfair obstacle for lesser players to overcome. Thanks for the reply comment, Juan José. 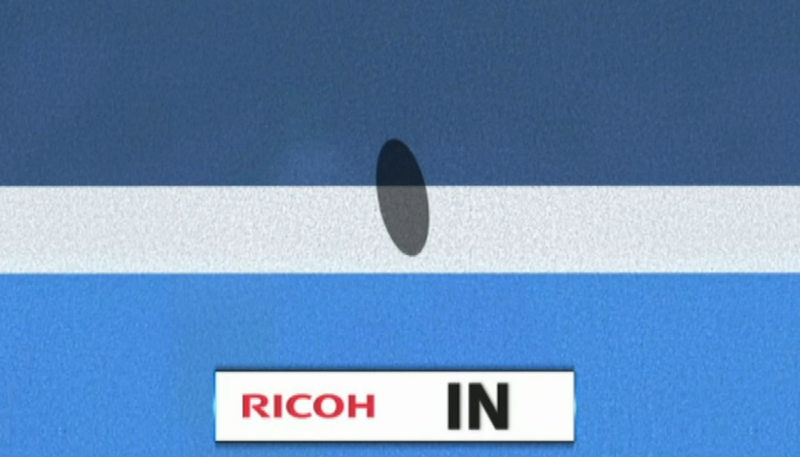 The one change I would like to see is that the umpire and line judges should be given the right to look at hawk-eye whenever he/she feels it necessary – perhaps with a guideline of less that 5 times a set or something. Players too should be given 5 challenges. I think reviewing every point-ending shot will end up being bothersome, since the players will not want to begin their routine to get ready to serve until they know if the last point was good or not. It sounds like a good proposal. The only point I don’t like is stopping a point halfway through, or even after the point is finished. 10 second points are not infrequent. Brilliant. Well argued, well thought out. I completely support this proposal. I came here from Jon Wertheim’s weekly mailbag on SI.com. I hope your proposal gets a lot of traffic and actually gets implemented. The Hawk-eye projection of the ball spot definitely has some error to it. This error can be represented visually as a light grey oval around the dark grey oval of high confidence. If the line edge falls in this light grey oval, then Hawk-eye should not be used to overrule the line judges’ calls (i.e. it’s too close to call). This essentially mimics the NFL’s current replay decision option of “the call on the field stands”, whatever that call may be. A GEM of a proposal. One of the great mysteries of mankind. Why doesn’t the French Open use Hawk Eye. Because there are marks on the court? Oh yeah, those marks are so clear right?